how to pronounce difficult English consonants! Teachers and learners often find that 'listen and repeat' instructions just end in frustration and despondency. But now learners will be able to see the vocal tract and the correct articulations. It's not enough to hear a sound, we also have to see and feel how that sound is made! Mount this poster on your classroom wall. Use it as an aid in explaining what happens in the mouth as consonants are pronounced. If you need help with this, the popular and affordable Essential Phonetics for English Language Teachers is perfect. 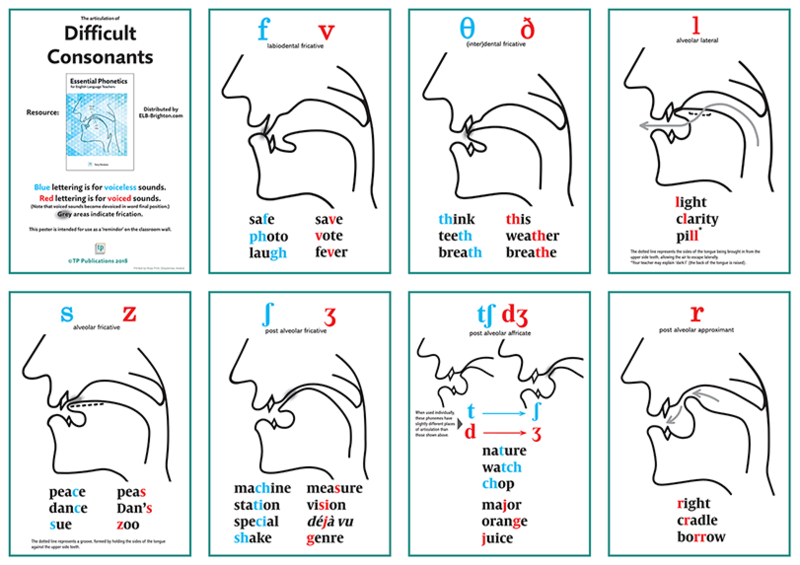 Then, any time during any class your students can glance at the poster for conscious assistance with their pronunciation! The vocal diagrams are large and simple, yet detailed in the essential parts. The coloured lettering for voiceless and voiced sounds distinguishes clearly. The words for practice are in large, clear font. The grey patch indicating frication is an exciting innovation. The poster is A1 size, not too large or too small. The paper is 150gsm glossy, strong but not heavy for mounting. It is mailed in flat A4 size. The prices below, which include postage, are for orders in Ireland. For UK orders please contact ELB-Brighton. For larger quantities and rest-of-world prices please contact us.